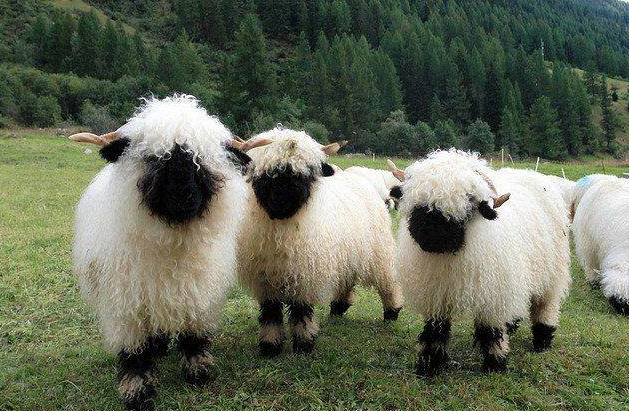 We knitters love Sheep. 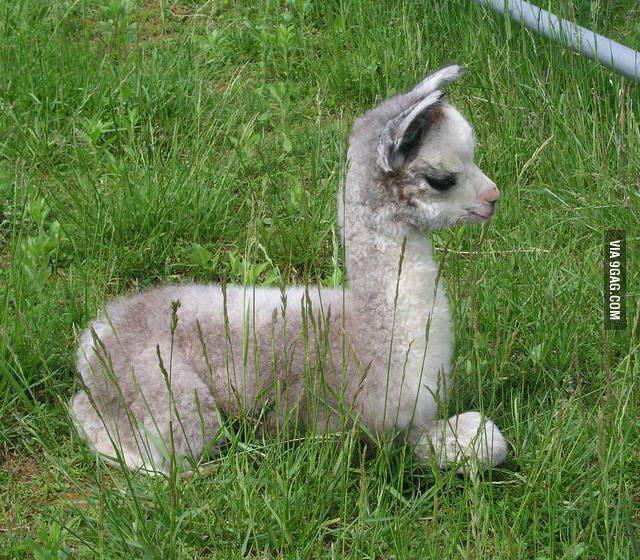 Alpaca, Angora Rabbits and any other critters that offer up YARN for us knitters, crocheters and fiber enthusiasts! Are you one of those knitters who always have too short of sleeves with your knitting projects? AND you don’t knit them longer the next time? Or take the time to figure out if you need to make them longer? Most designers and tech editors BELIEVE that the old standard of measurements are what to follow. Yet, if you buy a ready made item: the armhole depth is longer and the sleeves are longer. 19 inch sleeve ready for bind off. As I am on the last stretch on working a first sleeve, I am reminded of important tips when knitting sleeves. ALMOST EVERYONE needs to knit their sleeves longer than they think! My sleeve that I am knitting is at 16.5 inches. Most patterns for a size 34 would say that is more than enough length. BUT there are other factors to take into consideration. Where is the underarm joined? At your armpit? Or an inch or two from your armpit? The starting point on your arm will make a difference in the length that makes you the happiest to wear. Luckily, when working from the Top Down, you can try your sweater on to see what is the best length for you. But even then you might not be happy with the sleeve length! Why? Because most people try on the sweater and measure the length by having their arm straight at their side. Do you stand that way during the day? No. What happens is you move. You sit, you stand, you pick up things, you drive your car. Unless you are posing for a photo, do you ever just stand with your arms at your sides? When I just tried on my sweater, to test the sleeve length, at rest (arm at my side) I would seem to believe that I only needed 1 inch more to reach my wrist. Raise my arm to be perpendicular to the floor and WOW it is about 3 inches from my wrist! Now mind you, this is a fitted ribbed sleeve. So even after moving my arm up and down and all around, when placed back to my side, the sleeve needs to be 3 inches longer to reach my wrist. Looking at the sweater at the shoulder and the sleeve, nothing looks bunched up. The sweater looks like it should. So, yes, I plan on knitting the sleeve 2.5 to 3 more inches – which will make the sleeve 19 inches. Plus I will take the project one step farther and try it on AGAIN before binding off. And, yes, I may knit it that extra half inch. After all, I do like when a sleeve is nice and long. In knitting, this is not an exact science. 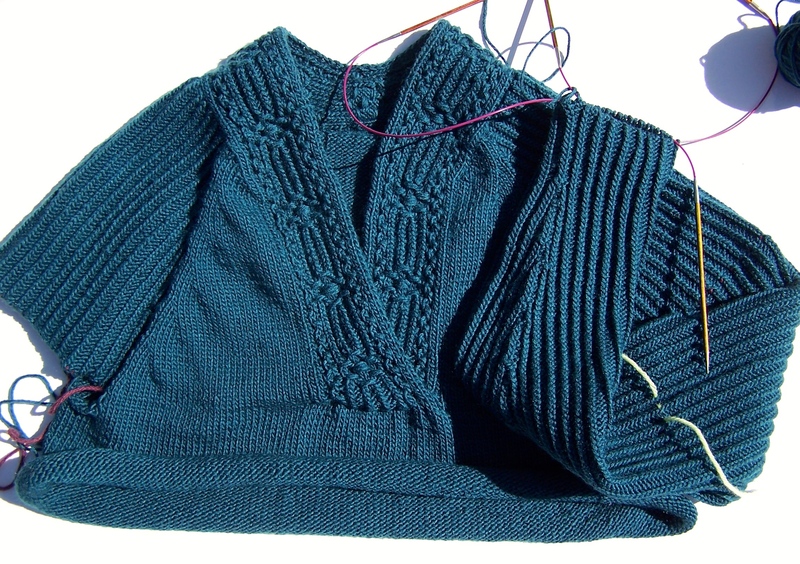 Once getting the yarn wet to block, your sweater can grow in length and/or in width. Even special care in blocking it to the size intended can give you a larger sweater. Also, once you wear your sweater, the size can become larger. I usually knit my sweaters to 32 or 34 inches in circumference. No matter the yarn, they ALL have grown by 2 or 4 inches in circumference – even working with smaller yarn and smaller needles. Side Note: I knit with 95- 100% natural fibers. Only allowing synthetic in a yarn’s mix for glitz or sock durability. If you are like me, I have knitted projects I don’t like to wear for one reason or another. Most of the time because I didn’t take the time to figure out if I was making it the right length or size. With experience, I am working on being patient. Patient to check my size, patient to work the piece longer. And as a designer, trying to give the knitter options to customize their garment to fit their body and needs. On this pattern, I am customizing the sleeves to fit my arms – NOT the generic sizing that the tech editors want. May YOU find the patience to make the changes with your projects, too. Several years ago I made a goal: Keep the Knitting Project Pile at a minimum! And I have been GOOD…..until recently. Well, I would say in the past year it has slowly slipped into the darkness…..You Know. The darkness of the pile of hibernating knitting projects. Some have been hibernating a long time. 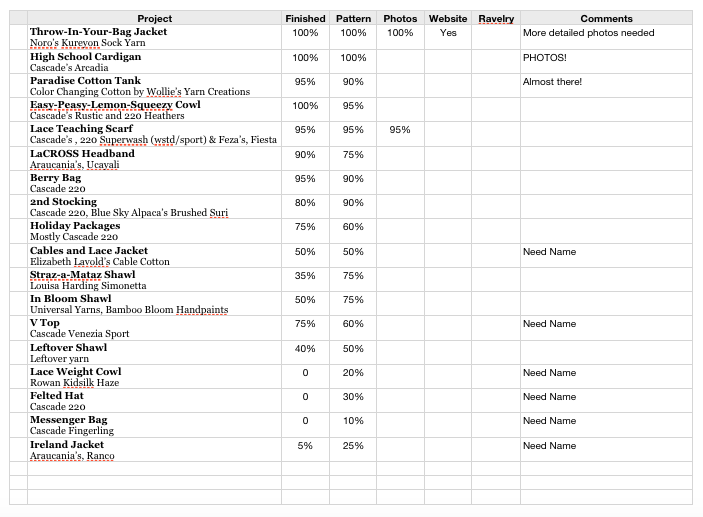 Like the good list maker, (or OCD personality my husband mentions) today I made a spreadsheet to encourage me to finish these knitting projects. The sad part is there are some hibernating projects that are not on the list. They are so far down in the dark hole that they have been stored away in the closet, only to be remembered when I rummage looking for something else and happen across their partially worked rows. Even as I write this post, I remember yet another project. I also have projects that have the pattern written or charts made and some with only drawn notes in a notebook or loose leaf paper. I have been knitting a lot lately. Enough that my right elbow has been cranky. 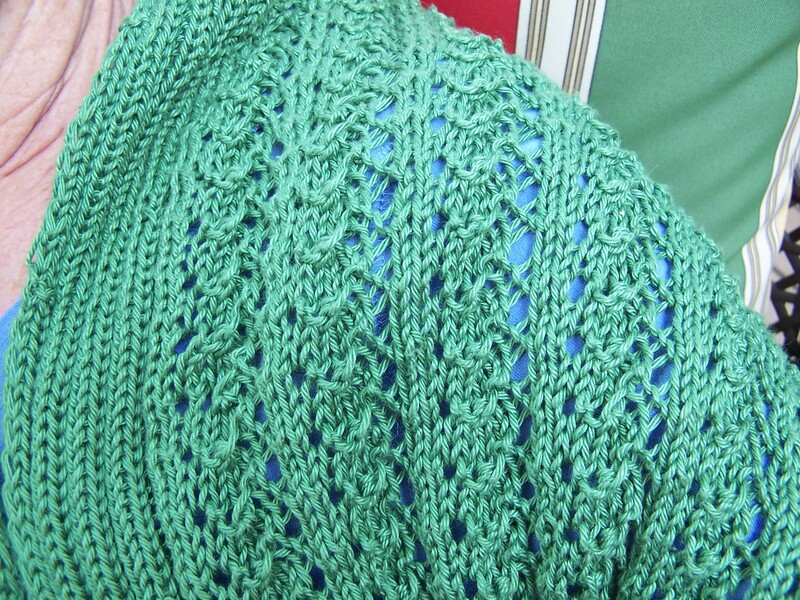 I have been knitting with Cascade Yarn’s Venezia Sport. An impressive lace pattern I used for the neckline. The back was shaped, stitches added and finally crossed at the lower chest area. I finished the skein just knitting in-the-round, then slipped the stitches to waste yarn. I am now about 3/4 the way through the left wearing sleeve. I usually work this way when designing. Once my sleeves are finished, I then can use up the rest of the yarn, allowing the body to be as long as possible. 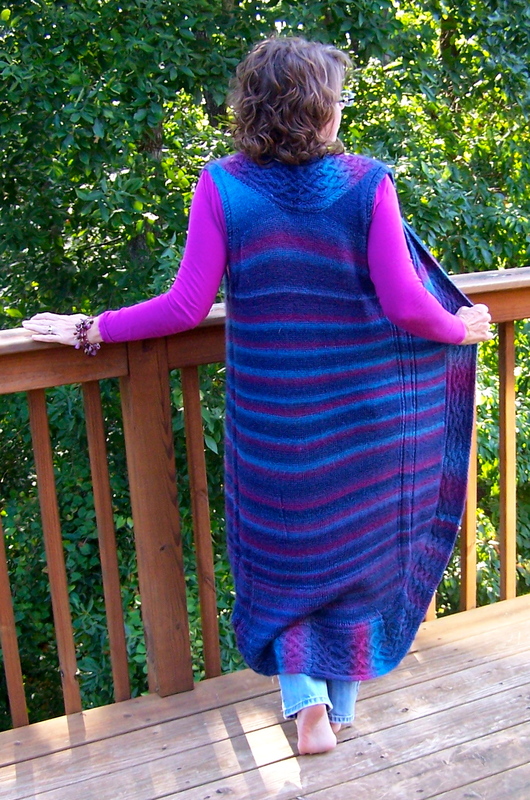 I am determined to finish this one before it is too warm to wear it – even at night! Well, I am headed back to my knitting chair. Tomorrow I meet up with a Knitting Friend! No knitting – just catching up, and yes, talk of my Pile-up of Knitting Projects! Maybe I will get some of the un-named, Named! Hint, Hint…………. I never really think about my Knitting Knowledge. Like many knitters, I have my sucesses and my “not to happy” results. I admire my stitches and sometime rip them out to start over. Yes, I can rip down a section of cables or simple lace and work them back to my needles with my crochet hook. It is very convenient and saves time when there is a mistake I cannot – or do not wish to – live with in the project. I have persuaded my mother to pick up her needles. She knitted Donna’s Lace Shawl for me. I designed it for a beginning knitter to be able to work a lace shawl that looks much more complex. It has slipped edges and only one row of yarn overs and knit togethers. The other rows are either knits or purls. This time she is knitted a bit more complecated piece. A poncho that had been modeled from one in her closet that she loves. This poncho is in another of her favorite colors. A pretty coral in wool. We have added a cable section down the front. It also starts with a crocheted temporary cast on. I love to shape neck lines with this type of method. Helping her, this week, has reminded me of some Knitting Knowledge that I take very much for granted. A big one: Not to use “knots” in your piece! When changing to a new skein do not “knot” the two strands together then continue your work and PRAY that the knot wants to stay on the wrong side of your work. Leave a long tail from each skein and weave the ends in with a tapestry needle after working several rows. There are many ways to do this to hide them. Some yarns “hide” better than others. Be patient and don’t be afraid to pick the yarn back out from your weaving to try another way. The next piece of Knitting Knowledge I would like to pass on is using a crocheted temporary cast on. After working with several designs with it, I have added to the poncho pattern my mother is working on (and will try to remember to add it to a few other patterns) a few bits of help. 1: Make sure the waste yarn is VERY different in color. This helps to distinguish yarns when cutting away the chain. 2: Use a large crochet hook. The larger the chains, the easier it is to see where your stitches are added. 3: Consider placing the stitches on an extra circular needle as you add new sts to the crochet chain. They are very easy to see when you first add them to the chain and you know how many to pick up. Cut the chain away after all sts are working into the chain and you have worked a few rows in-the-round. These notes can make a BIG difference in the patience required when ready to work the temporary stitches! I am working on a few simple designs that have help like this in the pattern. 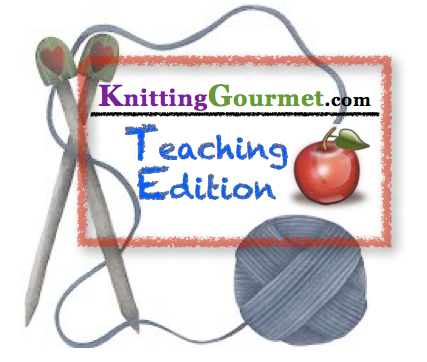 Teaching Patterns that can be used as a stepping stone to help you with your Knitting Knowledge. Life sometimes forces you off your schedule. I have still been knitting away, but posting has been on the bottom of my list lately. And now that the holidays are uphond us, well let’s just say schedules change daily. My Mom, Daughter and I are planning a trip to Ireland next fall. So, of course, I have Ireland knitting goals! I am starting with a light weight jacket from fingerling weight yarn in my stash. 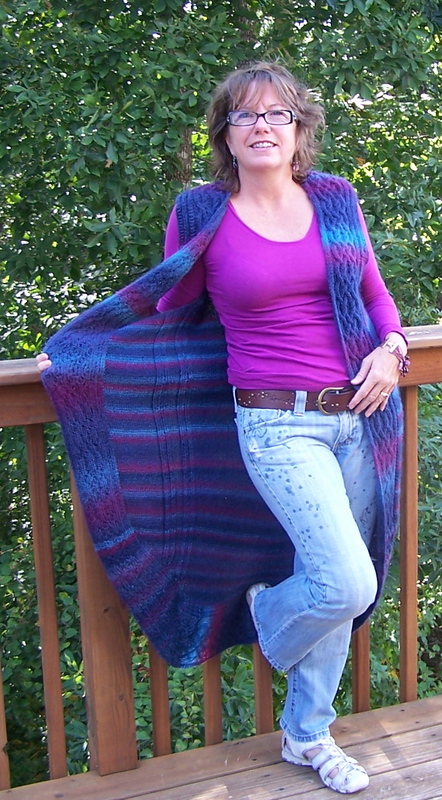 It is multi-colored and perfect for layering with other colors. 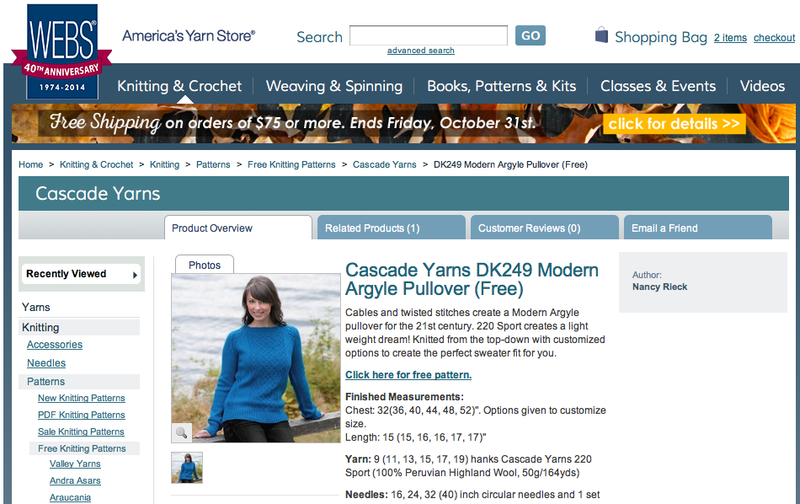 Cascade Yarns was my “go-to” company when planning. Cascade Yarns has dependable quality and I have numerous color cards for easier pairing of colors. Next was a large on-line store that would hopefully have more matches to what I wanted. I chose Webs. And Look What I FOUND! Yep! That is my design, Modern Argyle, I produced for Cascade Yarns a couple of years back. Like most of my designs, it is a sweater that is knit by more experienced knitters. It has been knit by posters on Revelry and they have worked through the twisted and unusual cabling. Modern Argyle is one of those I have knitted that I wish I could have kept. Oh, well, on to others in my head…….. But, what I have learned from this design, is how lighter weight yarn produces a more desirable garment to wear more often. So no surprise that I purchased for my Ireland wear Cascade Yarns Venezia Sport for a pullover design. My Barcelona Lace Jacket is made from this yarn and is probably one of my most worn pieces. I get excited just thinking about another piece made from this yarn! Well, I need to get back to that schedule thing. I’ll get some photos of the yarn that is staring at me for my Ireland Project and post again on my progress. Mozart wrote his first symphony at the age of four. 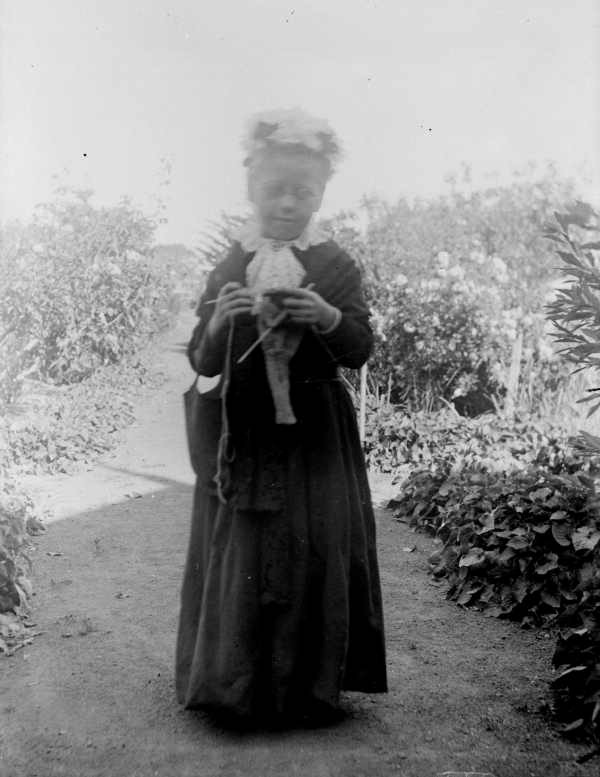 Many knitters learn around the age of ten and start with the garter stitch. We don’t add a string section (yarn overs) until we are much older. The Art of Making Extraordinary Stitches takes time and practice. The knitter must have the desire to take the necessary steps to improve the craft. Learning to purl, learning to fix mistakes. Not being afraid to rip. I remember the first time I ripped out a whole section of work. I laid the knitting out on the wood floor in natural light picking up one stitch at a time. I am sure I held my breath as I carefully slid each stitch back onto the needle. I was in my thirties. Before that I always dabbled at knitting. I would get frustrated at the dropped or added stitches in my work. It was once I learned to look at my work and see my mistakes that the love of knitting came into my life. I cannot remember the progression my knitting took. The bin in my closet that is full of too big sweaters and wildly bright ponchos is part of my learning. Knits. Purls. Yarn Overs. That’s all knitting is. The combinations are endless. Cables, lace, cables & lace, intarsia, fair isle, and fiendishly difficult stitches. These three simple moves with sticks and string create Extraordinary Stitches. I would like to encourage you to make the next move in your knitting. Drop a stitch and see it unravel. Cable or work lace for the first time. Choose a pattern beyond your skill level and make it your own. Take the Art of Making Extraordinary Stitches and make your symphony in yarn. Fall and What to WEAR! Inspiration during a fall walk lead me to design a long vest. The woman walking past me one day was wearing a beautiful long sweater vest. I am a sucker for longer jackets, cardigans and sweaters – so why not a vest! This vest starts at the center back, then is worked from the top-down once your cable pattern is established to run down both front sides. The cables then gently turn to meet again at the bottom center. If you are up for the challenge it is worth the walk! This has become a favorite of mine to wear in the fall. Download your pattern today here and get walking…..
My website is being switched from one host provider to another. If you have any problems while the transfer is taking place, please email me. A link is at the right. 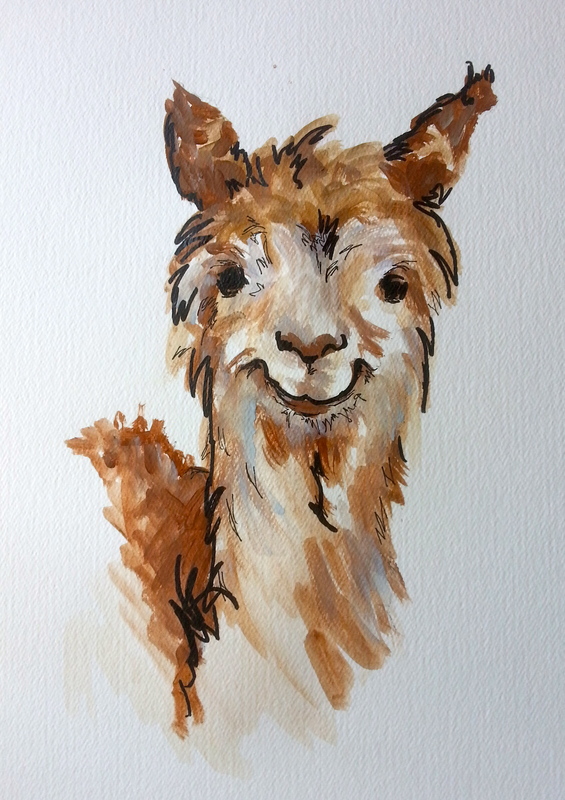 In the meantime, I am madly working on several things for the Australian Yarn Magazine. An article and a continuing column. The first will appear in the March issue along with a sweater for a “Tween” in your life! And to keep me extra busy, I have a capelet and a jacket that have arrived for me to write their patterns. One of my favorite cast ons to use when knitting from the top-down is the crocheted temporary cast on. When using a crocheted chain, I knit or purl into the back of a chain to add stitches to the neck. That way I can slowly add to the neckline and give it shape. Scooped neck, v-neck or just a lowered neck that won’t ride up when wearing. This temporary cast on takes some work to put back on the needles and every time I use one for a design I learn a bit more. 1. Use a large crochet hook with yarn larger than the project. This allows for the stitches to be seen easier on the temporary cast on. 2. Work more chains than you need for the project. As you are knitting or purling into the back of the chain, chains beside each other can get quite small and it is easy to pass them over. It is much better to have extra chains dangling at each end un-used than to grab more waste yarn and create another section of chain. 3. Whether you knit or purl into the chain makes no difference on the look of the neckline. But it will make a difference when you take the stitches off the chain. When you use a contrasting color of waste yarn, it is very easy to see the “bump” from the knit or purl. When this “bump” is facing you, purl into the chain to add stitches. When it is facing away from you, knit. That way all the stitches are on one side of the crocheted chain for an easier pick up. 4. When working back and forth on the chain it is very easy to add another loop around the crocheted chain. It is better to pick up too many stitches than missing a chain, but to help that I have started to use a contrasting color of waste yarn to pick up each section of stitches using a tapestry needle. So, after I pick up and knit six stitches into six chains I weave the waste yarn through six stitches. When I cut away the crocheted chain all my stitches are on the waste yarn for easy sliding onto needles. 5. Shortly after all the stitches are worked onto the crocheted chain I remove the crocheted chain. It makes it easier to see the shape of the neckline. AND if I am unlucky and cut my working yarn and can’t fix the problem, I am not too far into the project to start over. Then another big plus: I am ready to pick up the stitches and work the neck edge at any time. I like finishing the neck (usually after separating the sleeves from the body) to tell how the sweater will actually fit and look like at the neck. 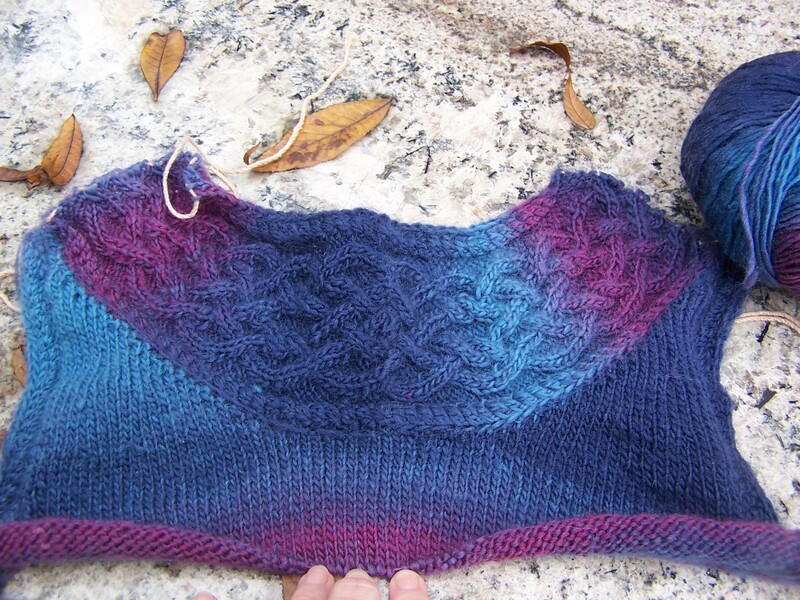 ANOTHER reason to knit top-down – you know what the sweater is going to look like BEFORE it is finished. Adjustments can be made BEFORE it is too late. Knowing tips and tricks for this cast on makes it a breeze to use for other projects. Reading about knitting history makes me think of all the changes in knitting – especially since the start of cyperspace. Where would we all be without the internet? And does the internet and the communities it offers, change the way knitter’s knit? But, think about it – don’t you still knit, purl and yarn over? Isn’t it still just moving around string with sticks? I think the biggest change of the 21st century in knitting is the ability to have a knitting community. There always have been knitting communities: in someone’s home, church, community center, library, etc. Those communities have not been available to all knitters. 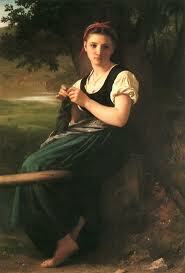 Many knitter’s in the past have knitted alone and have only been able to advance their knitting skills by reading. Now you can watch a YouTube video about how to work a move or technique. You can “chat” with a knitter thousands of miles away on how they proceeded on a project. It really is fabulous. But, in the mists of the whirling cyber knitting, one still can find the knitter who looks for designs that are pushing the envelope of creativity and craft. They are out there. Some are posted on the internet and even more are knitted, worn and admired without the aide of technology of the 21st century. 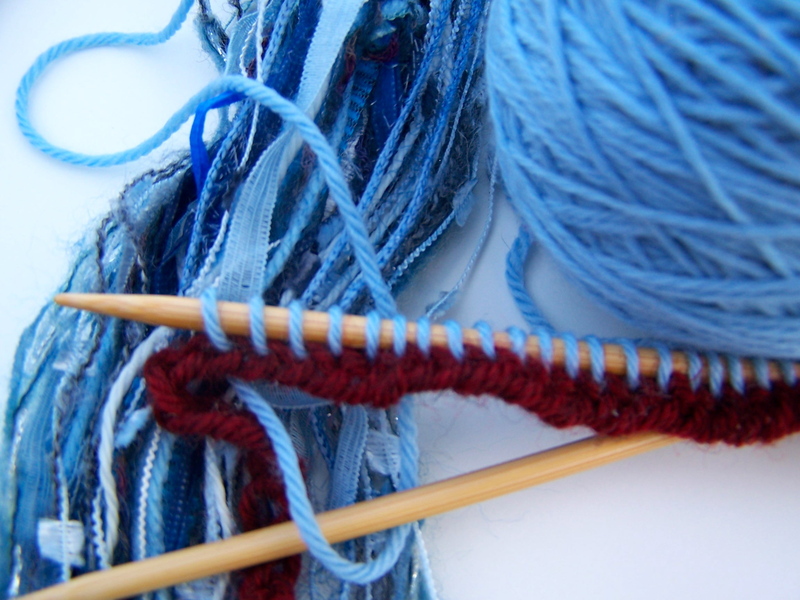 As I am caught up in 21st century knitting, I am constantly being torn – smaller, simpler projects? – or – More intricate challenging projects? Even if I start with a simpler project, I just can’t help myself to add something of interest. Even if it is an added embellishment. Which, to me, is what makes a project event more special. What kind of 21st knitter are you?